This is my second plan that’s designed specifically for building roundhouses in stages. As I stated in a previous blog post, I think building roundhouses like this is the simplest, easiest way to build an earthbag home: build in stages, one roundhouse at a time so you can pay with cash and move in right away. It’s far easier to start small and add on later than jump right into building a large home that could take months or even years. Please note, this design illustrates just one of many possible ways to build in stages with an added greenhouse. Many of my clients come up with their own design, often by combining various plans and options of mine. So have fun. Make a simple sketch and send to me at strawhouses [AT] yahoo.com for a free estimate. One easy way to do this is to print the plans from my website and cut out the parts you’re interested in. Rearrange the parts as you wish, glue them to another piece of paper, and draw any remaining parts by hand. Write notes on your sketch if needed. Scan and save as a jpeg file and email to me. This could also be a fun school project and good way to learn about designing houses. Total: 718 sq. ft. interior, Footprint: 38 x 52 ft. I see you’re working on Christmas…. Whether or not you celebrate it, idk, but Merry Christmas! But when you build in stages, how do you integrate the walls from one structure to the next? And even more troubling (for me) – how on earth do you integrate the roofs? It causes some extra work, but it’s mostly standard carpentry. People build additions all the time onto the side of existing houses. The added trouble would be far preferable than paying tons of money toward a mortgage. As far as the earthbags, you can use rebar pounded in at an angle to join the walls. Note on the greenhouse roof: Use short trusses at 2′ on center, and frame in the ends that join the roundhouse roofs. Use string-lines and fit one board at a time. It’s not complicated, just a bit time consuming. 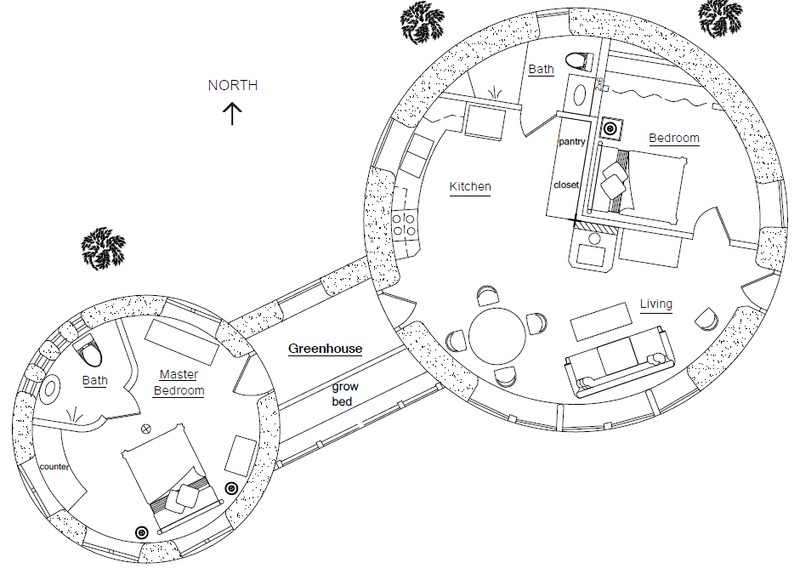 I have also designed a round house, but to go underground. It’s interesting to look at other ideas! Serendipity. My wife and I were just talking about a similar design and build plan… start with a main ‘house’ then spawn others as time and money allow. My suggestion for building house components in stages like Owen suggests is to completely frame the future door or window as if it were going in right away, and then before the plaster if applied, fill that opening with earthbags temporarily. That way it is easy to remove the bags when the time comes for the addition without worrying about the messy proposition of cutting through a bag wall. Another observation about Owen’s design is that, in my experience, a truly functional greenhouse really needs to have glazing from above as well as from one side. Especially for year round use, this is essential.